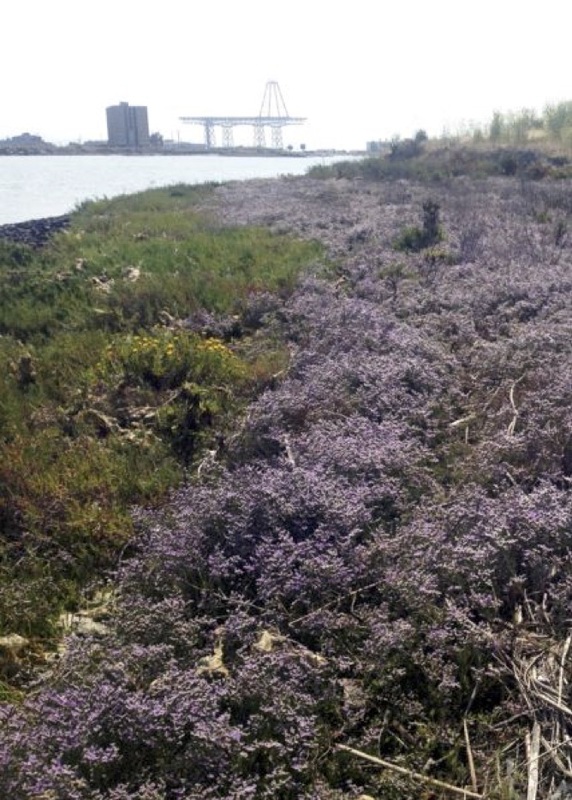 Limonium ramosissimum (LIRA) was first discovered growing in San Francisco Bay wetlands in 2007. Early research showed the species had the potential to negatively impact local marsh ecosystems. This study extends the monitoring period to investigate changes in this ecosystem. The current study included 1) Bay-wide mapping of LIRA populations and 2) mensurate surveys at three established study sites in San Francisco Bay assessing changes in LIRA, three native species and soil properties by repeating previous research methods. Bay-wide mapping found that LIRA populations increased from 15,000 m2 in 2008 to 32,000 m2 in 2016. LIRA was found at an additional 45 locations. LIRA significantly increased in cover in study plots with initial low LIRA cover. However, in plots where LIRA was well-established, all native species and LIRA decreased in cover. This decrease is likely attributable to a five year drought that began in 2011. Evidence suggests that native species Distichlis spicata (DISP) and Sarcoconia pacifica (SAPA) were most affected by expanding LIRA populations coupled with drought conditions. LIRA’s potential long-term impacts to soil properties include an increase in bulk density and lower soil organic matter, which could negatively affect marsh community structure. LIRA has proven to be a hardy, drought tolerant species and has maintained its dominance at the marsh level. LIRA has the potential to become a much larger problem in Bay wetlands, particularly, in light of climate change. A concerted, reinvigorated effort to eradicate this species from San Francisco Bay wetlands should be initiated.